I’ve always been attracted to humorous jewelry pieces. Anything that can make me laugh, I am all for. 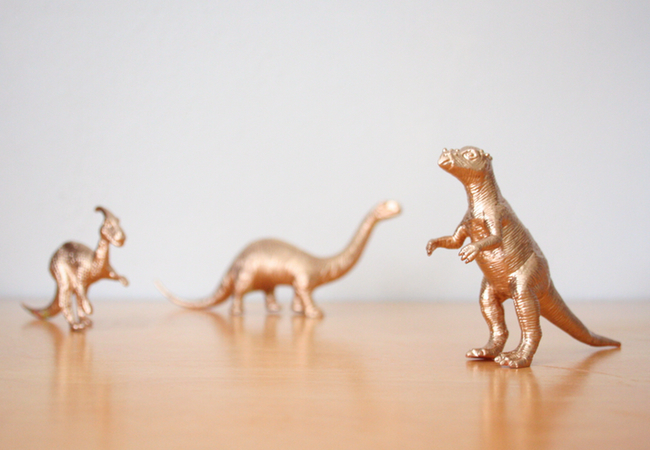 So, I came up with an idea for these faux gold dinosaur pendants, and I am in love with the results. I think I am going to start wearing these everywhere. For more ideas for quick and easy projects, click here to visit the tutorials page filled with more than 30 diys. Aw, thanks so much Ez. I really appreciate that! this is an adorable idea. 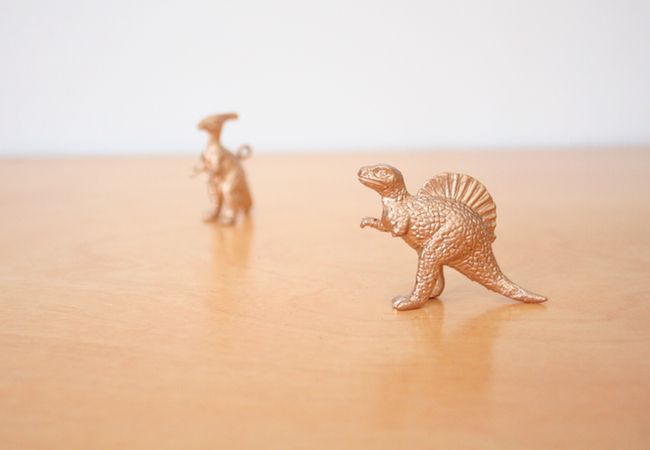 i especially like the little dinos for packaging. so smart! oh my, this is just adorable Brittni! love it, so creative and cute! thanks for the inspiration! xo. Thank you Danni and Christina. So glad you like the tutorial. I had a lot of fun painting all these little guys. I have a whole box of them now. 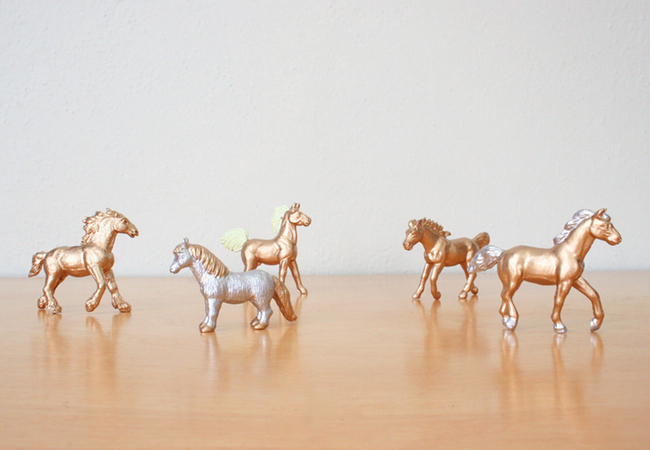 AND I actually found a couple of toy horses (yeah!) and used those two. I love ’em! Maybe I’ll post a couple of pictures of the horses. so cute! saving this awesome idea for upcoming birthdays (kids and adults!). Thank Em, Angie, and Rebecca. The proper name is an awl. 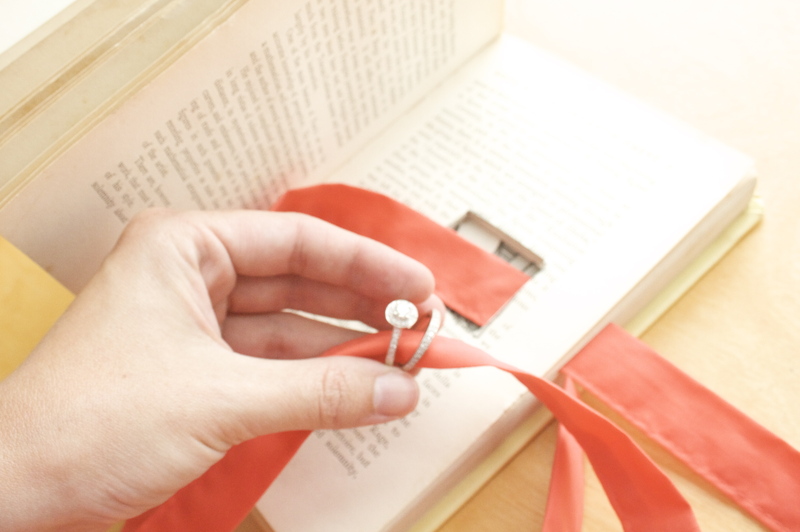 And you should be able to find them at any craft store in the bookbinding section. Or you can pick one up at amazon right here . There are tons! Sooo funny that I just stumbled upon this. 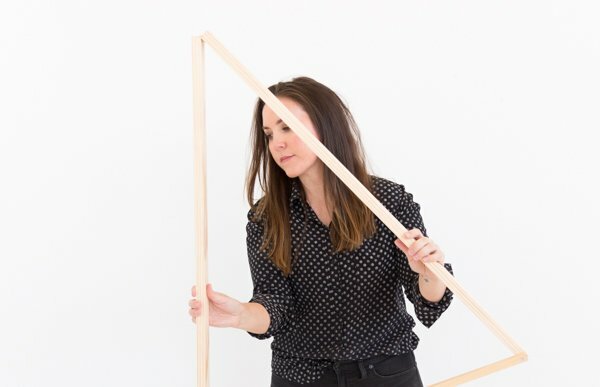 I was reading your tips on working from home and started checking out the rest of the blog. I’m potty training my daughter and I said I would buy her a necklace for a reward. She replied that she wanted a dinosaur. … Perfect!!! Oh wow. How perfect Kelly! I am sure she would love one of these handmade by mom. This is so cute. I bought a pin made from a plastic lizard that had been gold leafed. 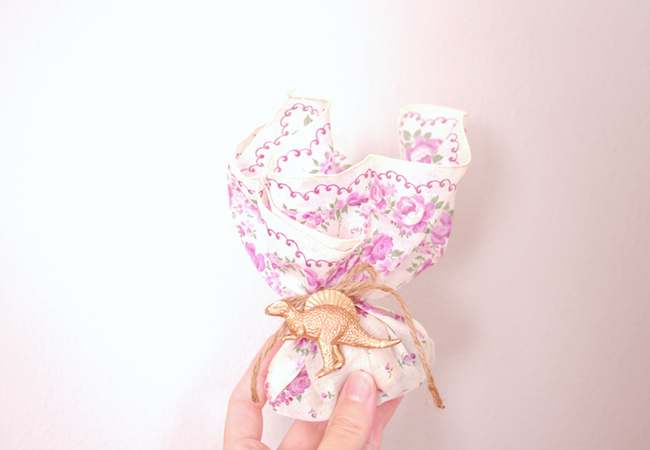 She then wrapped a bit of kimono silk around it and called it a “Kimono Dragon”. oh my word! that’s a crazy cute idea! Sounds cute Cindy. Thank you Kristen. This is amazing, I need to go buy some gold paint! I’m going to blog about you all over the place! Aw, thanks so much Betty And Pearl. I definitely made these a few weeks ago! They are really cute, I wear mine all the time! Thanks for sharing this fantastic idea! 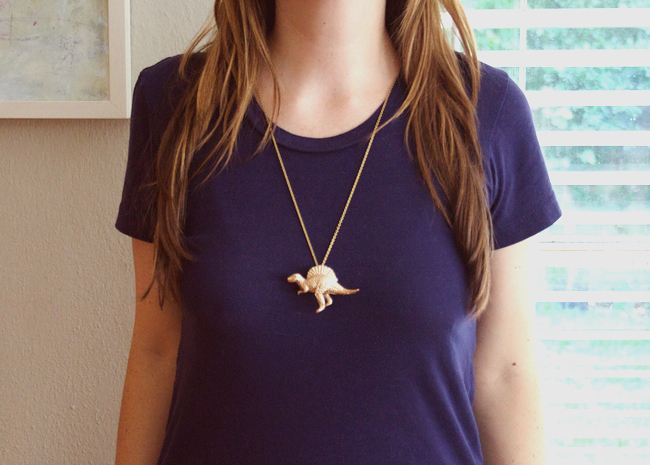 I couldn’t stop grinning when I first saw this post and I had a great time making my first (of 10 to come) dino necklaces! So, I was just telling someone today about how I love love love metallic right now. Not metallic leather so much… Just details. So, basically, I’m really really excited that you posted this today because I have to paint a whole bunch of stuff gold now. You’re awesome! 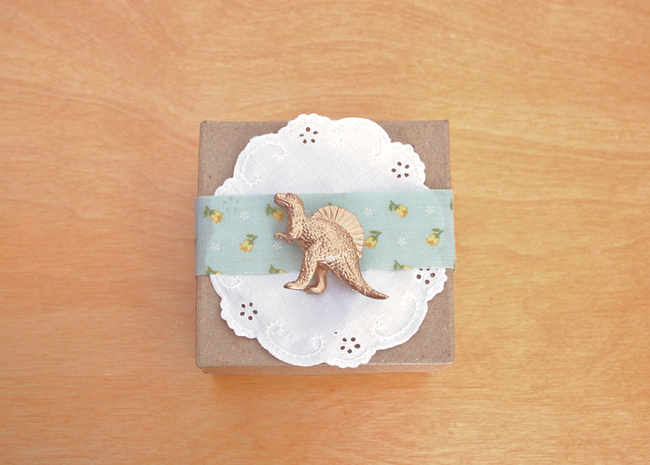 The dinosaur gift tags are a super great idea, too. I love the last picture, they look great with a dress. Thank you Brittany, Katie, and Katie! 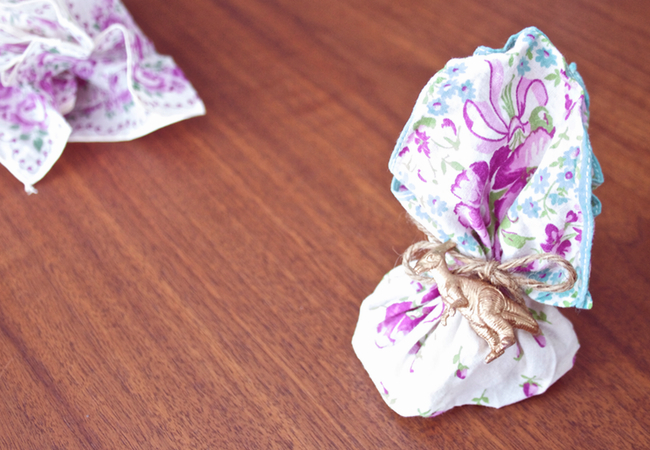 Katie (#1)- thank you for featuring this tutorial on your blog! 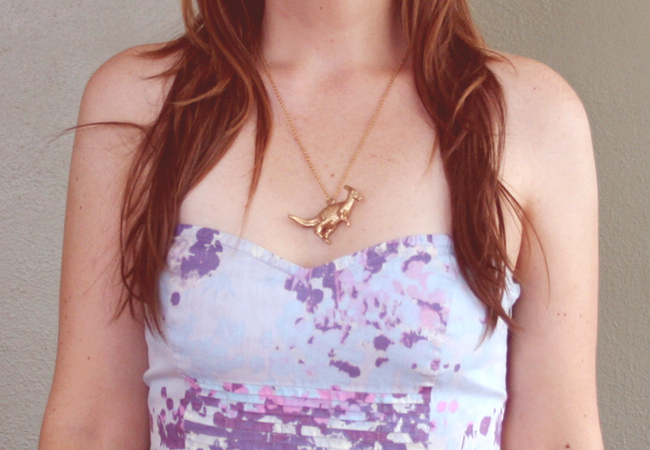 Katie (#2)- I love the dino necklace you created! It looks great. Thanks for sharing the link! And Brittany-so glad you like the project. I am loving metallics right now as well (clearly). 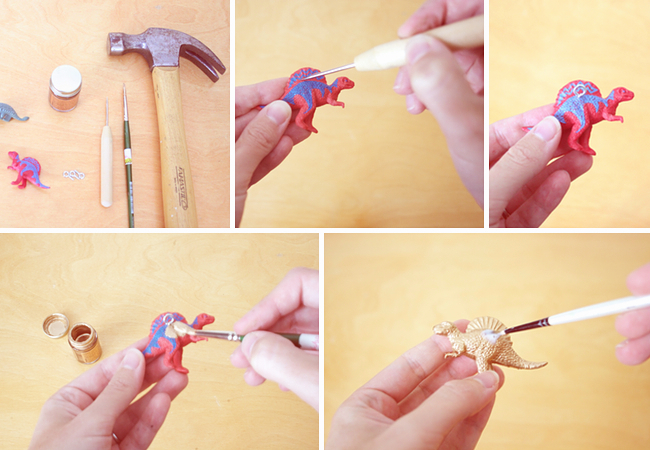 I positively love this tutorial, and have made A TON of gold dinos for me and my friends now. Definitely awesome. Hi Jane. I’d love for you to feature the project. Thanks. And that’s wonderful Amy. I am so glad. 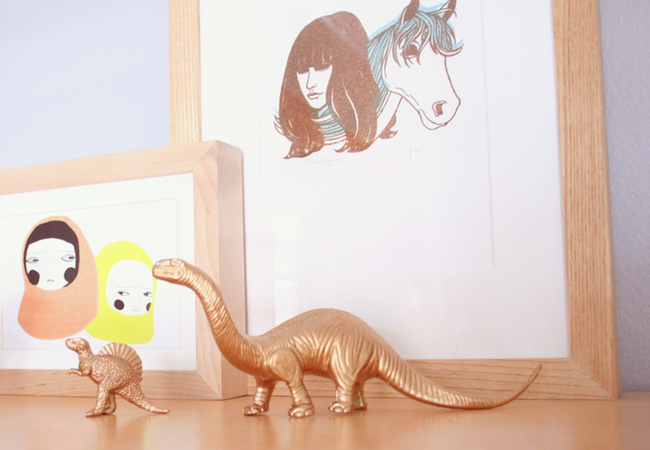 If you have any pictures of your dinos, I’d love to see them. The necklace is pretty cool. I love the tutorial you provided here, very detailed and easy to follow even for someone like me who’s not as creative like you, thanks a lot. HI!! i’m from mexico, and first i want to send a compliment for your whole blog you’re so creative, IÂ´m starting DIY and iÂ´d love to make this, but i’d like to know if you can recommend another kind of paint i saw other tutorial and they say it could works whit nail polish, but if you could help me i apreciate it very much, maybe a paint i could get in home depot, because here itÂ´s difficult to get that paint you recommend. i wish u more succes and the best!! Oh me Goodness I love you. I love this and I can’t wait to make my own. I also loved that you use an eye hook instead of just stabbing a ring in him. I can’t wait to make my own.